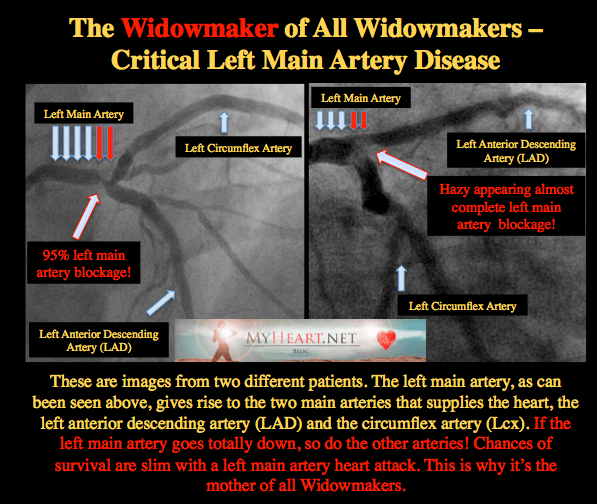 What Is The Widowmaker Artery And The Widowmaker Heart Attack? The Widowmaker artery is typically the main artery that runs down the front of the heart and supplies most of the heart with blood. 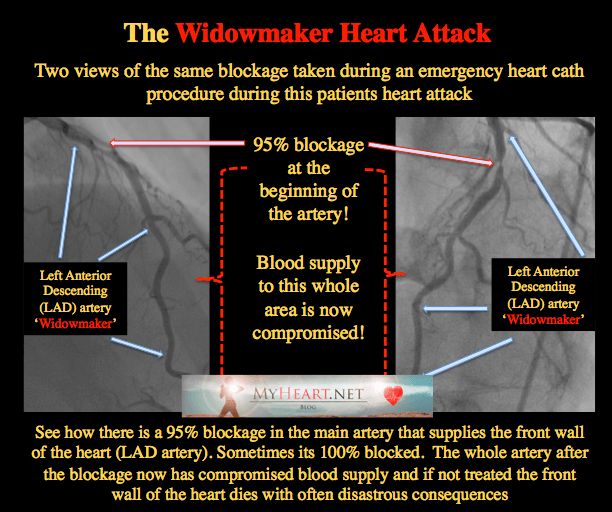 The Widowmaker heart attack happens when there is a critical blockage in the Widowmaker artery that leads to a large reduction or a total reduction in blood flow to the large area of the heart supplied and of course the consequences of such a large heart attack. The anatomy of the Widowmaker is described below. Why Is It Called The Widowmaker? No one knows who exactly coined the term. The fact is though heart blockages in the regions described below, known are known as the Widowmaker because they are known to be life threatening. This is because these blockages are right at the beginning of the main blood supply to the heart. If the artery goes down here, so does everything after that! Before we discuss the mother of all Widowmakers, lets take a minute to review a previous post on the Widowmaker (WIDOWMAKER PART 1), where I described the most common form of the Widowmaker artery heart attack, a blockage right at the beginning of the left anterior descending artery, also known as the LAD. This is demonstrated nicely in the pictures below. Also demonstrated is how this was fixed with a stent procedure. The Widowmaker To Beat All Widowmakers! 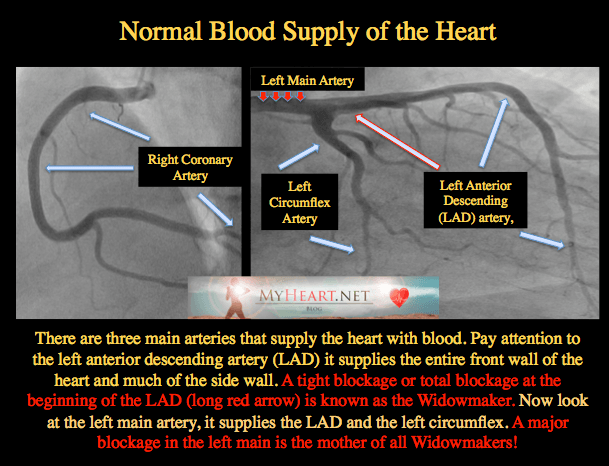 Now lets talk about the Widowmaker artery that trumps all Widowmakers, this is a critical blockage in the left main artery as demonstrated in detail in the diagram below. It’s called the left main artery, because as can be seen in the picture of the normal blood supply it supplies the entire blood supply to the main pumping chamber of the heart. This form of the Widowmaker is rare and as life threatening as you get. In the case of a Widowmaker heart attack that involves the left main artery, the patient will often not survive, simply because there is basically no blood able to flow to the main pumping chamber of the heart. Can You Fix The Left Main Widowmaker? A high-grade obstruction in the left main artery, particularly where it divides in to the two other arteries, is typically treated by urgent or often emergent open-heart surgery. Currently, for complex left main artery blockages, open heart surgery is felt to be the preferred treatment option. This is to avoid the Widowmaker heart attack! If someone survives a Left Main Widowmaker and makes it to hospital then they are very, very, lucky. Unfortunately most will not. It’s more common to present to hospital with the LAD (left anterior descending) form of Widowmaker and in this case the reason for survival is that there is still blood supply to the left side of the heart from the circumflex artery. Unlike the left main Widowmaker, in which case no blood can flow beyond that! 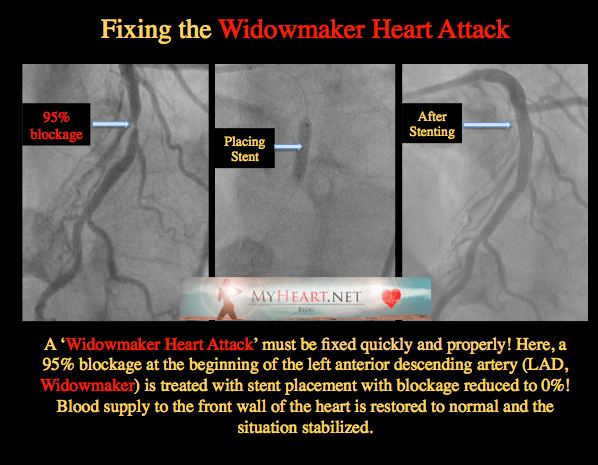 Sometimes, I have to perform a complex procedure and use a stent to fix even a Left Main Widowmaker, for example if the patient is felt too high risk for surgery. 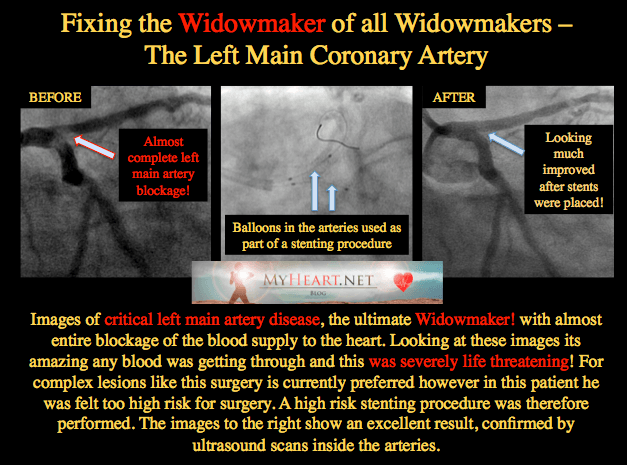 The picture BELOW shows one such case, before and after the use of a stent, with an excellent result, to treat a left main Widowmaker blockage. Do i need an aspirin every day? A heart cath was performed on me on July 10 and the diagnosis was the infamous “Widow Maker.” I already have three stents and am soon to be 77 years old. I was active up to the diagnosis. My medication has been changed and I am probably facing surgery within the next week or 10 days. 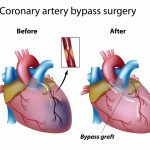 Will I be a candidate for bypass surgery or a stent? 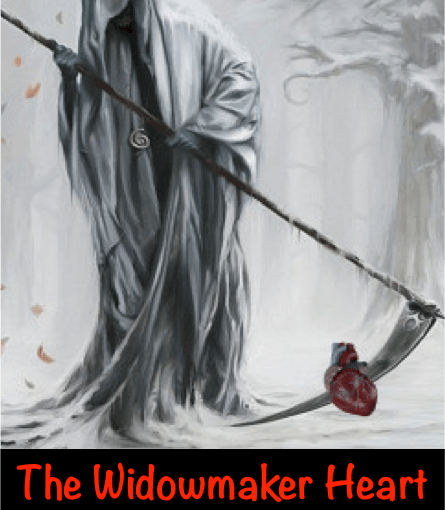 My husband was brought to the hospital and diagnosed with the “widow maker” – as the doctor called it, the big one. It was 100% blocked. He was 53 yrs old, otherwise very healthy (no prior issues). However, his dad died at 37 yrs old of a heart attack. The Cardiologist inserted a stent at the “Y” section. He appeared to be so normal and all of his tests afterwards were good. He was in the hospital- Sun, Mon, and released Tuesday night. I really feel as though the doctor should have done open heart surgery. In what case would the doctor choose the stent over open heart. He died a week to the day after having the heart attack. The autopsy (requested by the hospital), showed three arteries were 80% blocked. Reason for death: arteriosclerosis. His heart function was 35% after the stent. How could he have died with only 80% blocked? Thank you for helping me with this. I had a 90% blockage in my LAD in 2011, and received a stent, that only opened me to 60%. Its been almost 5 years. And now ive been having chest pain, discomfort in my neck, swollen feet, and heaveyness in my chest. I’ve been to ER a few times because of this, they do the EKG, EX-RAYS and BLOOD WORK. Each time they tell me all is fine and send me home. I know my body and I know something is going on. I can’t get them to do a stress test or have a look see to make sure all is well in there. I have had a widow maker and was 100 % blocked with 3 clots and I’m pretty sure you are experiencing congestive heart failure. Watch your salts and diet. I think you should get to a better hospital and get a cardiologist. You may have pain in your neck due to a blockage as well. This is life threatening for you to be experiencing this and should be taken seriously. Faith I hope you get the help you need before it is to late. I was told I was having indigestion when I went in the night before my widow maker and I insisted that I was having a heart attack and they sent me home and didn’t even draw blood for cardiac enzymes. Here came the second night and I was in the middle of my daughters 12th birthday party and started having my heart attack and had to be on life flight. That’s not even it the doctor waited 2 hours before he read my electrocardiogram and then sent me on life flight and here I am with a 35% ejection fracture and congestive heart failure and I am only 46 years old. Needless to say be firm and tell them you are not leaving until you get some answers. Please go to a CARDIOLOGIST and have more extensive testing done! The ER is not a replacement for regular visits to a specialist! You need a cardiologist and NOT the ER! Please find one ASAP. Did you have heart surgery? I did have questions. Can you please tell me how to recognize coronary artery disease if no shortness of breath, swelling, high bp, and blood levels normal. Only abnormality we found was EKG stating first degree heart block. Also, can you please tell me how long the symptoms can last with a 100 blockage on the right side and a 33% blockage on the left. The reason I ask truthfully is that it haunts me. My husband died of a widow maker July 16. I was supposed to take care of him. I sat in the car and didn’t even realize he was feeling badly prior. He was 59. Went to the gym the morning of and died less than an hour and half later. We were married 30 years. I don’t blame anyone. Just so very much trying to understand. The guilt is overwhelming. I hope that my message can assist you with your grief and guilt. My husband died of a widow maker and he was 49. He too, went to the gym the same morning. He sent me a text and said he got really weak during his workout and that he was at home and going to take a nap. He also died within an hour and a half after his workout. When I got home from work, he was already gone. I live with the guilt of not leaving work to go and check on him. The coroner’s report showed 90% blockage on the right and 95% blockage on the left. I spoke to the cardiologists at National Jewish Health in Denver – which is where I worked when my husband passed. They did tell me that more than likely, my husband would have to have been on the table in the operating room when this happened for any chance of survival. I kept thinking that I could have done something to help prevent this from happening. I feel your pain and I share your grief. It is a horrible thing to live with – but I believe that you and I did everything we could – it was out of our control. 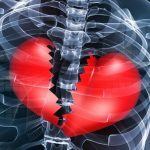 Sharon so sorry about your husband…My husband died July 21st suddenly after being told they couldn’t open his left circumflex, he already had open heart bypass on the LAD but doctor reopened it with a stent. My husband was 58…6 years of heart problems 11 stents, double bypass and Afib….He had just taken a shower and when I went upstairs to go to bed he had passed already. So much to question but won,t get into that and not enough info….I feel your pain as for me it will be 1 month tomorrow. Before we are born, we have 2 dates in God’s book, the day we will be born and the day we come home. Only God knows and that is determined before we are born so you and I have no control over when someone dies! My husband dies 3 weeks ago in his sleep. He made a rumbling sound, but often spoke in his sleep, s I told him to stop and he did. He died instantly I guess. I go back and forth between wishing he would have been able to tell me and then being grateful that he was peaceful. I don’t think i could deal with me trying in vain to save him. I’m heartbroken. He had injection infraction, but was on meds and was feeling great. I am a survivor of a LAD 95% blockage. I woke with chest discomfort! My wife drove me to the hospital and while being hooked up to an EKG I went lights out. I was revived and received 2 stents in my LAD on October 18, 2014. Ejection fraction was reduced to 33% and left hospital with a Life Vest, which I wore for 2 months. Thru diet, exercise I have lost 40 lbs and Heart Function is between 50 to 55% now. Doctors tell me an EJ of 60-65% is normal and I am 80-85% heart function. My thanks go to all the Drs and Nurses but specifically Kennedy Hospital in Washington Township NJ. (Dr McCabe )and Our Lady of Lourdes Hospital in Camden NJ. I was 57 years old, it has been 16 months and I go to the Gym, I lift, I walk/run, I row and I feel great. I am off all my blood pressure meds, and will remain on Brelinta for 2 more months. I will remain on Lipitor and a baby aspirin. Recent 2 stent procedure. Re-admitted with chest pain and cathed again. 50% blockage of LAD sent home. Is this medically wise or INSURANCE SMART! I had my widow maker 100% blockage on Thanksgiving at 1am. Called 911 and thanks to my great paramedics and super cardiac team, I was in cardiac cath lab in less than an hour. Two days after the stent, a perfect echo with no damage to my heart. My only warning prior were some episodes of left arm pain that I attributed to tendinitis , silly me. I was so very lucky. I did get two broken ribs and pneumonia after aspirating after car and paddles. Physically great now, did some cardiac rehab but no one really talks about the emotional aftermath do they. Guilt, hyper vigilance, anxiety. That I think will be with me for awhile. I was a light smoker with quite a bit of stress as well but bp etc good. Dr said it was the smoke that did it. No arguments here and I am not smoking but I do wonder how can you tell for sure? I am 55 yrs old a non-smoker, very occasional drinker, very fit and had a sudden intense pressure pain in the middle my chest at a morning meeting at work. Luckily my son was working nearby and drove me Hollywood style weaving through traffic to Sir Charles Gardner Hospital. I slumped on the seats in the ED department and the ED nurses took care of me so quickly, and soon had me hooked up to heart monitoring equipment. They diagnosed a heart attack quickly, had a cardiologist see me within a minute or two and then rushed me straight into a Cath Lab were a 100% blocked LAD (widow maker) was diagnosed. The wonderful doctors and nurses worked unbelievably well together and quickly inserted a catheter through my groin unblocked the LAD and stented the artery. Whilst this was happening an ED nurse waited outside the lab door and when my LAD was unblocked and my heart going again rushed back to ED to tell my son not to worry and explained everything to him. I then had the most excellent care in ward G42 for the next four days and discharged with medication and the excellent manual ‘My Heart My life’. We are so lucky here in Perth Western Australia, what truly wonderful people we have working at this awesome hospital. I was diagnosed with AFIB 3 years ago and have had 3 successful Cardio Versions since, last being September, 2015. I was diagnosed with a heart murmur 5 years ago and after a CT Scan, it was determined that I have a build up of calcium on my Aortic Valve and was told that it would eventually need replacing. My cardiologist has been treating my medicinally but after an Echo test, 2 months ago, revealing a deterriation of the valve as well as an aortic aneurism, he referred me to a Cardio Thorassic Surgeon who ordered a right and left heart cath this past Monday, revealing a blockage in my LAD…to what %, at this point, I’m not certain but I was told today by the surgeon that he’s recommending a by-pass, valve replacement, repairing the aneurism on the aorta, as well as a “Maze” treatment to aid with the AFIB, all at the same time. I am 66 years old and was told by him I currently have a strong heart muscle, and that these 4 procedures at one time were not uncommon and that he believed it to be fairly low risk and that it should be done “sooner than later”…but said it was up to me as to the time frame. Quite frankly, I am concerned and don’t know how soon I should schedule this operation. Any suggestions would be most appreciated. The operation itself as long as in good hands is not an issue. The timing depends on symptoms / size of aneurysm / degree of blockage etc. Without knowing specifics its difficult to tell. I have had 3 Heart Surgeries in the past 5 years and I am 52 year woman. My symptoms started about 7 years ago and I have a very strong family history of Heart Disease. I have been to a lot of Cardiologists, over this time frame, but my last two surgeries were performed by a Cardio Thoracic Surgeon. He is an amazing Dr. and truly cares deeply, about his patients. He saved my life twice. I will never fully trust the Cardiology level of Dr. again, myself, but once you go up to the next level, it is an amazing upgrade! If you are truly sick, with ANY KIND of Heart Disease, trust a Cardio Thoracic Surgeon. I learned to rely on my gut, if I felt like I was still sick, I probably was and your gut never lies! I had the Widow maker LAD 100% total blockage in 08 aged 56, drinker smoker loves food but not over weight, I was given a warning two weeks earlier with a chest pain while driving and a blood pressure of 180/90, , 6.45 pm was feeling strange so l grabbed the news paper and laid down to read, that didn’t work so l got up to go and get a drink, bang across my jaw as if l had been hit, a heart attack picked up the phone and l was receiving my stent 45 mins later. I am now 64 taking my meds and had a few trips to the cardiac dept but l have a problem where l can’t make any plans, I know l’am at a mature age and having lost 33% heart mussel but how long can a person like myself expect to be around, this is on my mind all the time lately. I know l have been lucky . I had a 99% blockage in my LAD , and received 2 stents. I’m age 46, non-drinker, non-smoker, excellent diet, cholesterol levels normal and overweight by 15-20 lbs. I had recently decided to go on blood pressure medication because my blood pressure was consistently high (averaging 140/90). I had visited the nephrologist the day before my cardiac event. No symptoms except feeling tired and a little pressure at the top of my chest (I thought is was stress)and left elbow, some jaw pain. I attributed symptoms to a change in BP meds. The day after my doctor visit I decided to go home from work because I wasn’t feeling well/very tired, but in the middle of the drive I decided to go to the emergency room. I got to the hospital in time, no heart damage. Currently the doctors are baffled about what I have because I also have an occluded left carotid artery (no sure when this occurred) and stenosis in the right renal artery where 1 stent was put in place 3 years ago. The arteries are in perfect health around the areas where the blockages occurred. The doctor recommended a visit to the Mayo Clinic in my future. My heart attack (at 38yrs old) consisted of four blockages, two were 100% LAD (one near the beginning of the artery and one further down) and two other separate branch arteries were 70%. I was very active at the time, didn’t smoke, but had a genetic predisposition. Two stents were placed in the LAD, and a prescription cocktail was prescribed. It’s been almost 12yrs since, and I feel good. I would like to thank you, Dr. Ahmed, for such detailed explanation and supporting pictures. On Sept. 19th of last year, my boyfriend of 4 1/2 years passed away. I came home to him after work, which was an hour after the last known contact he had with a friend. The coroners report indicated a 75% blockage in the LAD. It then noted 80%-90% stenosis in the Epicardial Coronary Artery. Conclusion: Atherosclerotic Cardiovascular Disease. He had just turned 30 years old in August. He had a history of palpitations since he was a teenager and went to a quick care doctor regarding tightness in his chest a month before he passed. Unfortunately, there was no reference to a cardiologist but rather a change in diet/sleep/stress etc. He did drink alcohol often as well as caffeine drinks. The palpitations he experienced had become stronger just before he passed. Ultimately, it was too late to make changes and we didn’t take steps towards additional testing. I just wanted to share, just in case someone else is experiencing similar conditions. Be sure to see a cardiologist right away, book an angiogram and do what is best for you. The 7th of december I was rolled into the cath lab. I was told then that I had 3 blocked coronary arteries. However I came out with 4 stents total 120 mm all in right coronary Artery. The left artery at begining has 20 %, LAD 60%, circumflex 50% and 60% blockages. I had gone to hosital emergency with burning chest on and off, enormous tiredness and fainting. They kept me did angiogram and installed these stents in the RCA . I left hospital next day. Since then I have stabbing chest pain, exhausted. Tired with getting out of breath even at rest. Since my angioplasty every day theses same symptons: chest pain lasting 20 mins to 60 mins at rest that goes away but comes back 4-6+ times a day, wake up all wet with sweats, sometimes woken up with coughing which goes away when up. Chest feeling are like tightening or /and stabbing and out of breath. new meds include atenol, rusovastin, plavix, asa. I am/was active 62 year old woman, normal level, well controlled bp, normal weight and not Diabetic. It was a shock to hear I had this level of CAD even if my parents both had CAD. Is this normal recovery after stent insertion? Should I return to emergency? Or wait till cardiologiste appointment the 13th of january? Thanks for answering and are there questions that need answering and will I just get worst and have to stop working? i just don.t have the energy anymore. Have you had any form of stress testing? I just survived a “widow maker”” heart attack. Intense chest pain and had my wife, an RN, drive me to the hospital (only live about ten minutes away). Quick ER recognition/diagnosis and initial treatment along with a 10 minute helicopter flight for additional treatment (stent) and I’m well on my way to full recovery. Was experiencing chest pressure and had a stress test about 7 weeks prior to my heart attack which was negative (5% of the population will pass a stress test while having blockage). Currently have a LifeVest due to my heart only working at 50% capacity but I feel better that I have in some time and am enjoying cadio rehab. 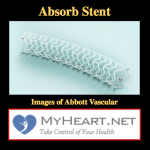 I had a stent placed in my LAD after 90% blockage when aged 49. Had high cholesterol even when on high levels of statins (Crestor). Have since been following Dr Esselstyn’s program from the Cleveland Clinic and cholesterol is 3.6 (139). Can’t believe more people on this site are not following a whole food plant based diet (no Oil) – it is the only program shown to reverse or at least halt the progression of heart disease!!! Do you have details of the angiogram report? What were the discussed options? What is the function of the heart? I am a heart attack survivor! At the time I was 31 with low blood pressure, average cholesterol, average weight and non smoker. I am also a woman. For all I New I was a low risk heart attack victim. I had a 98% blockage in my LAD artery and a STEMI. I was teaching when I thought I was having Heart burn. Symptoms got worse and I finally called for the nurse when I got dizzy , nauseated and my left hand started tingling. Soon it felt as if an elephant was sitting on my chest and my head would explode. I ended up with 2 stents in my LAD. I left the hospital with a 35% ejection fracture and damage to the apex of my heart. My cardiologist was and is still stunned with my heart attack. when I left the hospital the doctors didn’t really know what to tell me since I was so healthy before the heart attack. When I told my cardiologist about the car reck I had 9 months before that cracked my sternum he seemed to conclude that it was the impact to my sternum that may have caused damage to my LAD artery and led to the plaque build up and dissection. I did not seek the medical attention I should have after the car reck. Please get your heart checked after a severe impact to your chest. I am now back to 50-55% ejection fracture and off all meds but baby aspirin, take care of your self. Hello I’m 53 yrs old and just found out that I have a 100% occlusion circumflex Coronary Artery. I’m on medication and also baby aspirin everyday, I’m taking Ranexa 1000mg 2x day. My question is I’m still experiencing the heaviness, on and off chest pain, and my heart doctor said that I don’t have to worry because I will never get a heart attack. Is having a stent is the only answer to all of this? My good friend and neighbor showed up at my door and said “I can’t breathe”. When he got in the door he collapsed. I called 911 He was responsive at first. Never said anything about pain. He was 52. When the ambulance got here they worked on him around 10 minutes or so. Chest compressions. I thought he was breathing when he collapsed. I feel so guilty for not starting CPR right away. He had. 90 % blockage. I will always wonder if I could have saved him. I would like to first say I have read both articles and read all 850ish comments. My name is Scott and Sunday night September 3rd 2017 I drove myself to the hospital because I had signs of having a heart attack. Yes I should not have driven but I figured I would be quicker getting there then trying to round up a friend to take me. The pains in my chest were not overly bad and I had my wife on speed dial just in case I had to pull over. My pain was about 6 out of 10. I made it to the hospital 30 min away and they admitted me right away, normally 6 hour wait times. They did 3 ecg I am from Canada I found out it is ekg in the USA. The ecg did not show signs of me having a heart attack, but my troponin levels were rising. So they kept me in the hospital for the third ecg and a third blood test to measure my troponin levels and this time they dropped so I was allowed to go home. They dropped to 77 but I do not know what they were at before. I figured I got lucky; until Monday came along September 4th, 2017. I started feeling chest pains again around 5 pm I did not want to go to the hospital because I missed supper yesterday. I remembered the doctor saying he was giving me morphine to relax my heart. I still had some morphine from my shoulder surgery so I thought I would give it a try. My prescription allowed for two tablets every 4 hours. I took one and after an hour there was no change so I took a second one. Another hour went by and the pain was still there, the pain was still not really bad about the same as yesterday (6 out of 10). I asked my wife to go next door for aspirin; she came back with aspirin and also some nitroglycerin. I was told to spray it under my tongue and if no change spray again in 5 or 10 min. Neither doses had any effect on me and now to pain went from about a 6 to a solid 10. We live 30 min to one hospital but they do not have a heart specialist on duty/call. So our best bet is 107 Kilometers from home. I knew at this point I was in some serious trouble. My wife asked if we should call our neighbors to drive me or call an ambulance. I do not like wasting money so I had to think about this. I did decide on an ambulance because of how serious I now believed the situation was. I could not get into a position that would relieve any of my pain (tried sitting, lying on my belly, I did not want to lye on my back because I felt this was like giving up, the best position I could find was on my hands and knees with a cold towel around my neck). I wished I would have read these comments before because the person that mentioned putting his feet up to relieve the workload on the heart was brilliant but I never thought of it. The ambulance seemed to take forever they had to come from 30 min away. The two people that came to my rescue assessed the situation quickly and had me buckled in and on my way to the city 107K away. The trip seemed to take forever and the gentleman that was taking my vitals gave me 4 more doses of morphine with zero effect. I was also given gravel for my nausea this also did not help. I asked Brendon (the person looking after me) how serious is this. He asked if I wanted it straight or sugar coated. I wanted to know if I was going to die tonight or not, so straight please. Brendon mentioned I was having a serious heart attack and if I would have got a friend to drive me I would not have made it. The advantage of taking an ambulance is they can have everything ready for the patient when they get there. Once at the hospital I was admitted instantly no health card, registration straight into the operating room. The other advantage on taking an ambulance is Brendon was sending images of my ecg trail to the cardiologist. I was rushed right into the operating room where there were 5 or 6 people waiting for me. I do not know what they gave me but it allowed my heart pain to relax. This was so nice and then the next words I heard was we have to put something into my arm and it is going to hurt about the same as my chest pains did, yikes all I wanted was 10 min without pain but I knew I did not have an extra 10 min because I was diagnosed with the widow maker. The only thing I felt was an itchy nose from all that morphine I had in me. There was a kind nurse that helped with this because I was NOT allowed to move while they did the operation. A stent was put into my LAD 100% blockage. I also have 2 arteries that are 40% blocked but they do not do anything if they are under 70% where I live. I was in and out for the operating room in less then an hour. I still cannot come to terms on loosing my husband nearly 3 months ago…yes he had 11 stents and double bypass…the las stent was supposed to have gone into left circumflex but it could not be opened so was put into the lad which had already been bypassed..is this odd?…he went with minutes on the bed after a normal work day and shower…was this the Queen of widow maker…. I had the “Widow Makee”, according to my cardiologist. I have a full blockage (lad), and had a 60% blockage of the artery that goes around the heart Dr said my heart did its own bypass. I never had any symptoms for a woman having an attack, pain in neck, jaw, nausea. The only thing I can remember was that my human and I noticed that when I walked my left foot splatted when I walked kinda like not being able to control the downward strike of my foot. Dr sent me to catch on and they couldn’t fix the blockage, and put a piggyback stent in the artery around the heart giving it a 40% blockage. I have a new dr now and he just doesn’t seem to concerned about me staying on plavix (you can stop it if you want). I also have a 50-70% blockage of my carotid artery (right side) and he doesn’t seem to concerned with that either. He said we’d wait on it till I had symptoms to do anything with it. If I didn’t have any with the heart attack how would I know what symptoms I would have? I guess my question is should I stay with this dr or find a new one. I did have a chemical stress test with him last year that I had to ask for as he said it’s just not something that they typically would do. Difficult to advise you on whether to seek a new Dr or not, i would recommend repeat appointment to discuss the reasoning behind plavix duration and other details of management, if you dont feel well informed after the explanation then maybe time for a second opinion. If I may ask you a question. If a 34 year old person had a heart attack where the LAD blockage that damaged until the EF was recorded repeatedly over several years as being about 30%. That was over 20 years ago. A couple of years ago the EF was measured at 20 to 25%. What causes this? Also, what are the issues of a weakened heart with respect to the lowered blood flow causing slow incremental organ tissue damage? The drop in ejection fraction is causes by the fact that the damaged areas of the heart form a scar and do not contribute to the overall function. In many cases a heart pumping at 25%, if adequately treated with medicine, can supply adequate flow to the body at rest and should not cause organ damage. My father 56, is diagnosed with blockage of 70% proximal lesion in LAD. A PTCA over LAD is adviced for him. He is reluctant for surgical procedures. Is drug treatment enough. How much urgency is there for a Angioplasty? It depends on the stability of the lesion and the symptoms. 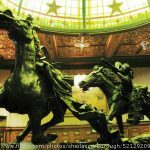 In cases of stable disease medical management is often sufficient. In cases of unstable disease, treatment is often recommended. In stable disease if medicines arent helpful procedures may be useful.